So here I am, upgrading my Fedora to 26 a month late again. I did not want to risk screwing it up just before my talks. I’m finally free of anything stressful and have just regular work on my plate, I can do it now! It took a little over half an hour and nearly 2GBs of downloaded data to get it upgraded. No issues, just one surprise when I started weechat. There were two buffer lists and some random errors printed in the middle of the chat screen. One by one, from the random errors I can see that it’s something to do with locale. locale -a | grep en - quickly shows that I don’t have en_SE in the list, this was the locale of my choice to get the right date and time format for Europe, and still keep it in English. I changed it en_DK which is what I’m looking for. Surprisingly this has nothing to do with Denmark, they just used that as a country code which has to be there, and EU could not be used for Europe. 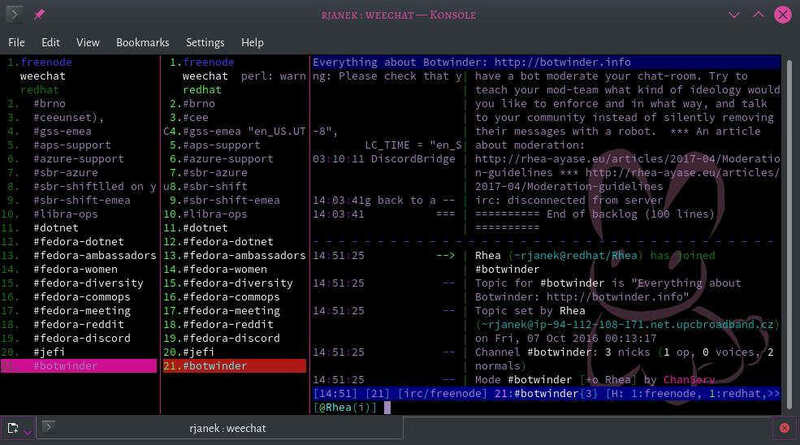 Weechat showing two almost identical lists of buffers? Turns out that they introduced new way to display the list of buffers, so now I have both of them active - buffers and buflist. Quick search for reference on how to disable one of them, and typing it in. /set buflist.look.enabled false - Second problem solved.